More engaged in ethically promoting our products and services? Having just completed our 2-day A4M/MMI Practice Enhancement Training, I am more convinced than ever that the only way to do this is to provide an experience for the team. An experience is very different from the ubiquitous lecture. Through interactive exercises, the goal is to spark in each participating practice member a process of inquiry. Ideally the journey begins with self-discovery, but goes on to yield greater job satisfaction, a deepened sense of purpose, an alignment of values, and joy in collaboration for the sake of the patient. The successful experience should also establish or reinforce your business mission, while at the same time identifying the cultural elements that are key to success. The process should also reinforce the attitudes and behaviors that constitute great teamwork. For the millennials who are often found on the front lines of your business, an insight-oriented, experiential program can be a wake up. For those whose main mode of interaction is digital, spending time in face-to-face activities may provide a glimpse of the importance of customer engagement. No matter what type of business you are engaged in here are four easy-to-implement tips for providing ongoing insight for your team. One of the best ways to start the day off on the right foot is to have your team meet each morning. Begin your huddle by reading your mission statement. If you don’t have one, get one. As a leader you can share what’s important to get done, but you would be better served by using a bit of time for remembrance and story telling. Ask each person to share something that they are grateful for. Encourage someone to tell a patient/client success story. Reinforce learning by discussing a journal article or a passage from a book. Or use this time to go over issues, deliver praise, or gently point out how we can do things better. I am a big fan of mystery shopping your business at least once a year. This can provide objective, un-biased data that can quickly squash common objections. A mystery shopper can shed some light not just on the people, but also on the physical plan, processes, procedures. 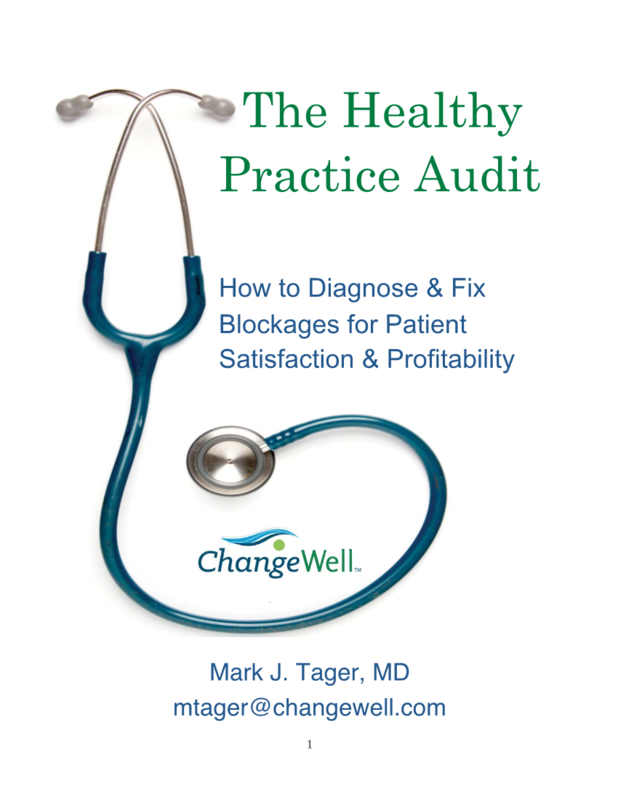 Download our helpful Practice Audit here. 3. Recognize That Others Don’t Always Share Your Perceptions. Not everyone views their work with your perceptions, nor measures occurrences with your same interpretations. The biggest gap will often lie between those who by nature (genetics and early childhood upbringing) are more attuned to the needs and feelings of others and those who are more logical and quantitative. The reality is that a successful practice needs the contribution of both “energy types:” logical people who evaluate quantitatively, and feeling people who understand how—in this case—patients and staff will feel as a result of decisions. 4. Reinforce the Big Picture. How do you keep the big picture in front of the staff? Return often to your mission statement. Discuss your Why? Share the big picture with staff. Self-disclose as appropriate. Celebrate moments of group achievement. For those in healthcare this should be easy. For ours is a noble profession in which each and every person in a practice contributes to the process of healing. A bit of interactivity can go a long way to helping everyone remember this basic premise.